This isn’t the first time we’re hearing from London’s Simian Mobile Disco this year; in May, James Ford and Jas Shaw put out their third full-length effort, Unpatterns, to a mostly encouraging reception. A Form of Change consists of songs that were recorded during that LP’s sessions, yet, for the reason of apparent ill-fitting, didn’t make the cut. 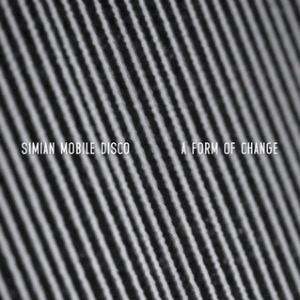 It only takes a brief listen of the EP to realize why: while making use of the same set of analogue instrumentation and a similar array of tricks and tweaks, on this release, Simian Mobile Disco fashion their lush tech house sound into a strikingly different timepiece. Ford and Shaw have always walked a thin line between mass dance accessibility and full-on cerebral electronica, and A Form of Change arguably veers towards the latter more than any of their earlier releases. Compared to Unpatterns, which was a grandiose yet playful manifestation of deep house grooves and cut-up vocal samples, the EP feels subdued and self-contained. The tracks are soaked in an impenetrable ambient aura, take a while to develop, and rely extensively on hypnotic, ice-cold loops. None of these traits are bad though – all four pieces have a mischievous pull and establish a transfixing, sophisticated listening mood. It would be a mistake to think of A Form of Change as an odd compilation of outtakes – it is Unpatterns‘ worthy companion and a true follow-up.